Custom Camouflage Headliner, Camouflage Seat Cover, Large Skull Rearview Mirror, Skull Shifter Knobs. Custom Fabricated Body and Suspension Lift. Engine rebuild with Supercharger added. Want to be able to fit 33x12.50 tires on it and have more than enough power to pull em. 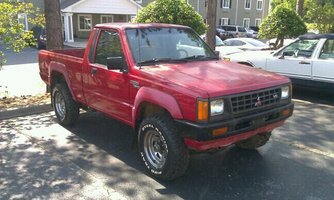 Added my 1991 Mitsubishi Mighty Max!